crossroadstarot | Exploring tarot through literature and mythology. Exploring tarot through literature and mythology. The works of William Shakespeare offer many archetypes and symbols that appear in the cards, including many types of fools. The fools of Shakespeare’s earlier plays embodied the lighter and more entertaining aspects of the Fool’s character because they were written for the clownish Will Kemp, the wildly popular comic actor of Shakespeare’s troupe of players. 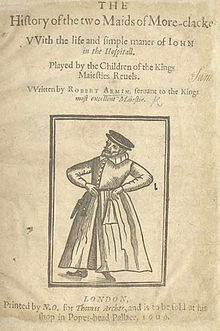 But when Kemp wandered off to Morris Dance his way from London to Norwich, Shakespeare had a new player to write for in his fool parts, Robert Armin, who was more suited to the roles of the wiser and wittier fools of Twelfth Night, As You Like It, and King Lear. His treatment of the fool as a humorous clown evolved into a presentation of the fool as a reminder of the darker side of life and as a call to make sense of the world’s nonsense. This recognition of the encroaching darkness, the abyss, mirrored the experience of the British people as they moved from the expansionist mindset of the Elizabethan Age to the depression and fear of the Jacobean Age. A couple of weekends ago, I celebrated spring with my son, Travis, and his girlfriend, Sachi. We started at the time of the equinox, 9:30 PM, by testing out the the theory that an egg will stand up on its end for an hour before and and after the moment of the equinox. It worked, and we soaked up the atmosphere of equal day and equal night, feeling balanced and in harmony with the earth. Here’s what it looked like. We also talked about projects for the garden we would be working on the next day, the first day of spring. We shared spring gifts, like Russian style painted wooden eggs, turmeric tea, and lavender soap. In the morning we did our own exercising and reflecting to get us in tune with the stretching towards the sun the plants around us were doing, and we did some planting and clearing in the garden, young mustard greens, nasturtiums, aloe plants. We brought roses in to bring spring indoors, and in the afternoon we had a tea and tarot activity to get us into the spirit. Here’s the structure we followed to help us reflect on the spirit of the season. We each chose a deck to work with, and pulled out cards to go with four different aspects of the season. We used images from the RWS deck to get us started, using the prompts below to work with the cards. The winter is ending, and so is the last yearly cycle of work and reflection. It is time to finish with the last year of both joys and losses and to wake to the breaking dawn that offers a new quest, and a new sense of purpose. The 10 of Swords shows the darkness and hardships of the last year giving way to a spring morning, promising opportunities for growing new fruits and flowers of accomplishment and happiness. Find a card from your deck that shows a picture of what you are leaving behind from your last year, something that has outlived its usefulness, that you no longer need to carry around with you. Describe what you are leaving behind, without regret, and what the bright sky of dawn means to you. The Temperance card shows an angel with one foot in the spiritual, emotional world of water, and the other foot stable on the firm shore to stay grounded. The spring dawn has clearly broken in the background, strengthening the promise of early morning sky in the 10 of Swords. The path to the mountains is illuminated by the sun’s light, showing you a clear track to follow your quest. Find a card from your deck that shows you something of your first steps on your journey. What do see in the card that encourages you to believe you are on the right path for you, like the blooming irises in this card? The tarot suit of Swords represents the effects of spring, slicing through the dark clouds of winter to reveal the bright blue skies and shining sun that warms and nourishes us. The Ace of Swords offers the raw energy of this time of year, giving mental and physical prowess and growth. Accepting the Sword of your own destiny helps you focus on your goals, wielding your purpose and talents to keep on your path and face obstacles with confidence and strength. Find a card that represents your own Sword of energy, something that keeps you pointed toward your goal. 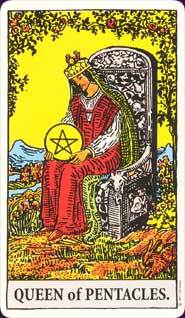 The Queen of Pentacles resembles the goddess of spring, Eostre, who is still vaguely remembered in the spring holiday, Easter. Her animal, a rabbit, appears near her throne, a symbol of the energy and fertility of this season. She is comfortable in the landscape of flowers, waterways, and a rich sunny sky. She reminds us to enjoy, even luxuriate in, the beautiful and health-giving season she rules over. Find a card that shows your feelings of celebration during this happy time so full of promise and potential. Getting ready for BATS next weekend, I’m working on a close reading of Woolf’s “The Searchlight.” Here are my lecture notes for the introduction. Can’t wait to explore the story during our session. I’ll post the close reading itself after I get the benefit of our discussion next Saturday. I always learn so much from our seminars! Virginia Woolf was born in 1882 and developed an acute awareness of the rigidity and smugness of prevailing 19th century attitudes that assumed she would take her place in society accordingly. Unwilling to be bound by societal norms of class and gender that relegated her to a codified domestic life, she wrote both fiction and essays that challenged the status quo. She named the new century of her adulthood the Modern Age, and used a fresh and dynamic approach to write about everyday life in the midst of the 20th century explosion of urbanization, technology, global war, and cultural change. Like her fellow Modernist writers, she mined themes, symbols, and works of the past for nuggets of meaning to enrich her own works. But she applied a modern psychological consciousness to her writing, and delved deeply into the human mind’s capacity to observe and make meaning from sensory details and associations from ordinary life as well as from large events to explore the macro and micro elements of the changing world she lived in. Bay Area Tarot Symposium Coming Up! On August 15th and 16th the fabulous Bay Area Tarot Symposium will take place at the Doubletree Hotel in San Jose. It promises to be the biggest one yet, with an eclectic mix of leading lights of tarot, as well as some very exciting presenters who are new to the symposium. On Saturday the 15th I will present another of my tarot/literature crossovers, this time on a Virginia Woolf short story. My friend Sophia Mao introduced me to this story through her erudite and fascinating Honors Thesis for the English Department at UC Berkeley. Her writing on the images of “The Tower and the Telescope” inspired me to see the story with a tarot agenda, which yielded a very rich reading. Here’s the description of my presentation that the BATS program will use as an introduction. While many readers see Virginia Woolf’s work as daunting because of her use of stream of consciousness, her fragmentation of time, and her haunting but difficult mysticism, her work can be accessible and enjoyable when read with the tarot as a key to her symbology and themes. In our time together, we will do a close reading of her very short story, “The Searchlight,” using the images of the Tower card to unlock the door of understanding to the story’s message. Like her Modernist contemporaries, Yeats and Eliot, Woolf taps into archetypes that offer wisdom and guidance for our modern era, archetypes that are reflected in the tarot deck in usage during their era, the RWS deck. The 22nd annual San Francisco Bay Area Tarot Symposium takes place on Saturday and Sunday, August 17th and 18th at the Doubletree Hotel in San Jose. To register, go to the Daughters of Divination BATS page: www.dodivination.com There will be a huge program this year, including Lenormand as well as tarot presenters. I’m especially looking forward to seeing Bill Haigwood, creator of the Counterculture Tarot, and Julie Cuccia-Watts, creator of the Journey Into Egypt Tarot. Click here to read the passage from The Waste Land to which this essay refers. Below are the cards that are mentioned in reference to Madame Sosostris’ tarot reading in T.S. Eliot’s The Waste Land. The blank card is not shown. Images are from the Rider-Waite Tarot Deck. Corresponding lines are listed below the cards. In the first section of the poem, “The Burial of the Dead,” he introduces his method of collaging “fragments [he] has shored against [his] ruin”(430), fragments of experience and culture to give our lives meaning. He also starts to bring together the overarching theme and mythical background of the whole work. He mines the ancient myths of renewal that were used to celebrate the coming of spring, focusing especially on the legend of the Holy Grail. This legend is the story of the quest for a means of renewing the waste land of ordinary existence through the healing of the maimed Fisher King, whose wound represents the illness of his realm. The poet twists these myths and other historical and literary allusions to show that something has gone wrong in modern times, that our world is sick and longing to be healed. Although Eliot is quite explicit in his copious notes to The Waste Land about his feelings of despair about the modern world, the poem itself offers some hints that there might be a possibility for hope of regeneration, at least for individuals. This is especially apparent in the stanza of the first section which describes a tarot reading, although at first sight it may not seem that way. The epigraph of the poem refers to the Cumaean Sybil, the ancient Roman oracle who guided heroes on their quests. According to myth, she was granted eternal life by Apollo, but not eternal youth, and she becomes a dried up crone in a cage, begging for death. Having established the decay of the oracular power the Sybil represents, Eliot introduces “Madame Sosostris, famous clairvoyante”(43) as a parody of the ancient myth, a contemporary mortal woman with a “bad cold,”(44) who is the “wisest woman in Europe with a wicked pack of cards.”(45) While some critics think the poet is making a reference to Mme. Blavatsky with this character, she is hardly a sybil, with her self important attitude towards clients displayed in her insistence on delivering a horoscope herself, “one must be so careful these days.”(59) But the substance of her reading, as she reveals the cards one at a time, has power and meaning all the same, using the same myths and symbols that Eliot employs throughout the poem. Although the line in the poem seems final and hopeless, Eliot’s method of using allusion to enrich his work yields a depth to the card’s meaning, implying that a “sea-change” will come, that there is hope of a “pearl” even after drowning in the sea of despair that the modern world has produced. 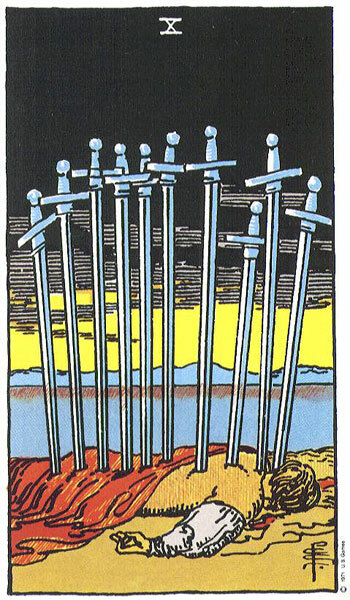 Eliot admits that this card is not actually one of the official cards of the standard tarot pack, but the image on the 10 of swords seems appropriate to represent the theme that Eliot gives this card, perhaps even the ambivalence of its meaning, represented by the darkening or lightening sky, depending on the perspective of the reader. Next, “Belladonna” appears, the “Lady of the Rocks, the lady of situations.”(49) Again there is a possibility of two different readings; Belladonna could refer either to a beautiful woman or to the seductive but deadly nightshade plant. If we use Eliot’s clues, the Queen of Cups fits this card. This Queen holds out a Grail in seemingly benevolent way, and yet she is cut off from the seeker of her gifts by water and rocks. Again Eliot gives us a chance of renewal, but in a way that is fraught with peril. The next card, “the man with three staves,”(51) is identified by Eliot in his notes as “an authentic member of the tarot pack,” (Notes to The Waste Land)and he notes that this card signifies the Fisher King to him. In the 3 of wands, a man stands looking out at a waste land, longing to be healed and to see his land come to life again, but he can only be regenerated through the quest of the hero who searches for spiritual truth and feels compassion for others. Eliot may tell us that there is no hope in the future, for the king or for us, but the card itself holds fragile buds of life in the wands the figure has planted in his waste land. The fourth card to be revealed is The Wheel (of Fortune), another card that offers a spectrum of meanings. In Eliot’s interpretation of the world as full of “futility and anarchy,” the wheel turns round and round, like the “crowds of people walking in a ring”(56) that Madame Sosostris sees in her vision. To Eliot, we are like the king of Greek myth, Ixion, who was punished for his sins by being condemned for eternity to spin through Tartarus, lashed to a fiery wheel. But the card itself also carries the possibility of chance and change, of spinning the wheel to move to new opportunities. Instead of spinning in a fixed position, repetitively and without direction, The Wheel can take us on a ride that spirals upward, taking us to new heights and vistas. Eliot now presents us with the “one-eyed merchant,”(53) a card not strictly defined as a member of the deck. 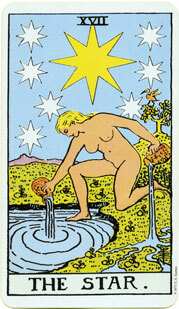 However, inspection of the 6 of pentacles shows a figure who does indeed fit that description. This card shows the merchant holding scales and distributing coins as charity. In part III of the poem, Eliot depicts this character as Mr. Eugenides, the “unshaven” merchant who sells currants, a denizen of the grey, bleak, and greedy “unreal city.”(207-211) But the image of the card, while ambivalent, offers the possibility of compassion and balance, of putting the merchant’s coins back into circulation. Like the motif so prevalent in the poem, of stopped up water that needs to be released, this card shows the possibility of allowing our human connections to flow again as well. Madam Sosostris now tells her client that she is “forbidden to see”(54) what the merchant is carrying on his back, represented by the “next card, which is blank.”(53) Since Eliot was using the RWS deck (as evinced by his description of the 3 of wands as the “man with three staves,” RWS being the only deck in circulation at that time to have that image), it is reasonable to assume that he was thinking of the blank card which came with the deck. He gives no explanation, but it is possible to think of what the merchant “carries on his back” as some kind of treasure or boon that he will distribute to his community, like the coins he hands out to the beggars. And it is tempting to find a comparison of the blank card to the blank stone that comes in a set of runes, which can show not only what is hidden, but also the opportunity of creating one’s own fortune, one’s own destiny. Eliot ends the reading with The Hanged Man, whom he associates with “the hanged god of Frazer,”(Notes to the Waste Land) who, in his great work on mythology, The Golden Bough,” uses the same motif to describe the vegetation rites that ancient people performed to keep their lands fertile and safe. But instead of presenting the card in a way that completes the ritual of rebirth and regeneration to which the poem has been leading, Eliot has Madame Sosostris say that she does “not find The Hanged Man.”(54-55) He indicates that there is no renewal for us, that the traditions and religions of the past have been lost, and we have only “ruins” of what is left from which to cobble together a personal meaning for our lives today. Eliot clearly felt that our traditions and beliefs had been smashed and torn beyond repair. But the images and themes he presents in this tarot reading can take on a story of their own. Although he notes that he is “not familiar with the exact constitution of the Tarot pack of cards,”(Notes to the Waste Land) his choice of cards reveals that he knows enough to structure a story that can still have different ending from the doom he feels is ahead. This “heap of broken images”(22) that we wander through in our own waste land can still be brought together and made whole by the creative, visionary mind, for “in the mind of the poet, these are always forming new wholes.” Phlebas, the drowned Phoenician sailor, is ready for a sea-change. The Queen of Cups holds out the Grail to the seeker who perseveres in his quest to heal the Fisher King. We can still spin The Wheel of Fortune for a chance at a new life, while compassion and connection to others is in our grasp if we balance our lives and share our gifts. Our own destiny is still to be written on the blank card, and if we search for The Hanged Man, we can right him and accept his blessing and wisdom. The Complete Poems and Plays, 1909-1950, T.S. Eliot, 1980. Includes The Waste Land in its entirety, with Eliot’s own notes. T.S. Eliot: The Longer Poems, Derek Traversi, 1976. An excellent critical study of Eliot’s major works of poetry. eliotswasteland.tripod.com This is a hypertext site of The Waste Land with complete annotations. The Golden Bough, A Study of Magic and Religion, James Frazer. There are many editions of this groundbreaking work, some abridged, some illustrated. Eliot relied heavily on it for the mythical background of his poem. From Ritual to Romance, Jessie L. Weston, 1920. Eliot incorporated into The Wasteland Weston’s theory that the rituals of the ancient vegetation religions were encoded in the tarot. 3000 years ago, the early Celts were building great outdoor stone temples across the British Isles, such as Stonehenge in the southwestof England, and Newgrange in Ireland. All of these colossal monuments have one thing in common, a shaft of light shines into the heart of the structure at the dawn of the Midwinter Solstice. The word solstice means “sun stands still,” and the ancient Celtic world held its breath to wait for the sun to return and bring back its light and warmth. We still mark the darkness of Midwinter with customs that descend from the ancient Celts, even if we don’t recognize them in their present day garb. One of the most important elements of the Midwinter tradition is the Yule Log. The Druids burned a special log at the Solstice, which burned (or smoldered!) for 12 days, starting on the Solstice, marking the celebration period for the return of the sun. A piece of it was saved for next year’s fire, to ensure good luck and abundant crops the following year. Their descendants kept up this custom by burning their own Yule Logs, searched for and brought into the house with much ceremony. After the sun went down, the log was lighted in the hearth with libations—of both the sacred and profane type! The 12 day period of Midwinter feasting and relaxing was filled with storytelling, music, dancing, and enjoying the company of family and community. They also had time for quiet reflection on the past year, and played games of divination to see what the new year would hold. In our modern world, where we do not defer to the cold and dark of the winter season, or to pretty much anything that may try to stop us from working, getting, and spending, we think of the 12 Days of Christmas only as the title of a fanciful song. To ancient peoples, the weather of those 12 days provided an enforced time of rest and celebration, when they could enjoy the turning of the wheel of the year, when they did not have to shoulder their burdens. This puzzling verse makes no sense within the context of the song; there is never another mention of the Ivy, and it’s not a tree, anyway. But using Celtic stories to tease out this two-part riddle, we can see the origins of some of our modern holiday traditions. A much older, pagan version of the song, The Contest of the Holly and the Ivy, uses the two plants as symbols for a contest between men and women: man is represented by the prickly, more aggressive holly tree, and woman appears as the softer, feminine ivy, which wraps itself around the holly tree. To the Celts, the turning of the seasons needed the balance of the qualities represented by the winterdance of these two partner plants. Both of them were evergreens whose berries appear in winter, and we can understand how the Celts would view their vitality against a backdrop of the bare trees which had gone dormant. They brought these living decorations into their homes as a reminder of the fertility of nature in spite of harsh conditions, and the promise of the return of the light of the sun. In the same way, we decorate our winter environment with vibrant lights and greenery, maybe not quite consciously, but somehow responding to the same impulses that earlier peoples did. Bringing the seasonal symbolism back into the Christmas carol shows a wonderful evolution of the mythology that opens itself up for us when we go beneath the surface. The story of the ancient Oak King, born on Midwinter under the shining star of hope, the promise of light returning to the world, is fused with the symbolism of the child born under the Christmas star. And the Holly King’s affirmation of life appears in the jollity and generosity of Santa Claus. The older celebrations and beliefs of the Celtic Yuletide tradition are not lost, just transformed into customs which can fit our busy and productive schedules. We can enjoy them as such and still be filled with the Solstice spirit. We can also look a little deeper into the history and meaning behind these customs to help us have a more profound experience with the changing seasons and our natural environment. Here are some tarot exercises that explore the themes of the Winter Solstice. The images here are from the RWS deck, but you can use any deck you like with the exercises. In the image from the 5 of pentacles from the Rider-Waite Tarot deck, the two figures are “left out in the cold.” Find a card from the deck you have chosen to work with that represents your own darkness at this time of the year; perhaps your anxieties about the new year, your feelings of being cut off from others, or situations in which you feel like you are walking right into a strong wind. Is there any light offering you hope for the future, like the stars that shine in the window of this card? The 4 of swords offers refuge from the cold and dark outside, like the quiet time and space we all need to organize our inner lives. Reflection and analysis of your situation will help you take up your sword to face the outside world again, but this time with strength and precision. Find a card from your deck that represents a safe and comfortable meditation space you can go to in your mind. Enter the image on the card. How does it feel to be there? Note all the details around you so you will be able to visualize it again when you need to enter it again for your time of respite. The tarot Star shines in the sky as a beacon of hope and promise for the coming year. The woman in the image has one foot in the water and one on land; she is comfortable in the watery world of emotion and spirituality, but she is grounded by her connection to the earth. The stars above her light and guide her actions. Find the Star card from your deck. How does it enhance your understanding of your own personal Star of hope? Now search your deck for an image that represents the dream your Star offers you. How does this image fit your hopes for the coming year? The 10 of pentacles shows us a gathering of generations, complete with children and dogs. There is an aura of celebration and community that exemplifies the Yuletide spirit, with Stars of hope hovering above the figures. Find a card in your deck that represents your ideal sense of fellowship and connectedness with others. How can you bring this spirit into your life, and into the lives of those you care about? How can you carry this image into your daily life, so it’s there to help you make connections with others? I like to spend time around the Celtic holidays to reflect on the last season, and look forward to what I’ll be putting my energy into in the coming months. I find the themes and archetypes of the tarot fit nicely with the journey around the Celtic wheel of the year. I’ve developed some tarot exercises to explore those themes and archetypes. I use the RWS deck as my baseline, and then I choose another deck to work with, something seasonal, or to fit my mood, or just a deck that I’m learning to work with. Here’s a handout that I give out for my Samhain/Halloween workshops. Several of the tarot cards depict themes that have relevance in exploring the symbolism of Samhain. The Moon card represents our connection to the spiritual otherworld through our dreams, visions, daydreams, and imagination. As you look at the picture of the Moon card from the Rider-Waite-Smith deck, try to see it as an invitation to look beyond the veil—between the worlds at its most transparent time of endings and beginnings. Do you find this glimpse of the otherworld attractive? Frightening? How does it reflect your own dreams and visions—sleeping or waking? Find the Moon card from another deck. Does it enhance your understanding of your dream world? The Death card represents the ending of the old year and the sloughing off of outmoded ways of thinking, feeling, and acting. This card urges us to leave behind what we no longer need—what no longer helps or sustains us. Find the Death card from another deck, and compare and contrast it with the picture shown here. How do you feel this process of ending happening in your life? Now choose a card from your deck that represents something you need to get rid of to make room for the blessings of the new season and year. Consider habits—even addictions—toxic situations or people, outworn attitudes or beliefs. What card feels like the dead leaves of your life? Which need to be blown away by the crisp and invigorating wind of autumn? Now take a look at the “harvest” of the last year, represented here by the Seven of Pentacles from the RWS deck. Reflect on your work of the past year. Choose a card from your deck that captures something of your “harvest.” How does the card depict what you have gained? What memories and achievements will you store in the winter months to nourish and warm you? The new year dawns like the sunrise of the Temperance card. The angel has one foot in a pool and one on land, representing an ability to move between the ordinary “earth” world and the “water” world of dreams and visions we first entered at the invitation of the Moon card. Compare the Temperance card from another deck with this one. How do they offer you a glimpse of your new path? Find a card that represents the “crops” you would like to plant for the next year. What are your goals? Your deepest desires? What would you like to involve yourself in? Samhain(summer’s end) was originally the Celtic festival celebrated around November 1st to mark the end of the old year and celebrate the beginning of the new. The festival had a two fold purpose–to commemorate and communicate with the dead and with the other inhabitants of the spiritual world in which the souls of the dead now lived, and to reflect on the past and catch a glimpse into the future of the individual and the community. To find ways to give this holiday meaning for us, here’s a little of the history that goes with it. The Celts mourned and prayed for the souls of those who had died in the past year, to help them move along on their journey to the otherworld. They also believed that on that night the veil between our everyday world and the spiritual otherworld was at its thinnest and most transparent, and that contact was possible with ancestors and others who had gone before them, as well as with spiritual beings who inhabited the otherworld, just out of their reach and vision, but all around them. So they immersed themselves in a celebration of and connection with the dead, later echoed in the Christian holiday constellation of All Hallow’s Eve(Halloween), All Saints’ Day and All Souls Day, put together by the Catholic Church to exert some control over pagan practices that were too strong to be eradicated. 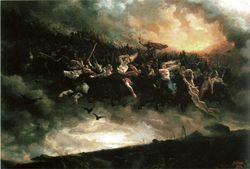 On Samhain (as on May Eve) the Lord of the Dead, Gwynn ap Nudd (in Wales, other regions had various names for him), rode his giant dark horse with thundering hooves across the night sky, accompanied by his pack of “hell hounds,” white dogs with blood red ears, and the fluttering, shadowy souls of the dead. While the Lord of the Dead and his train traveled in our world, the gates to his realm stood open, and heroes could embark on the perilous journey to visit the Underworld, to acquire treasure (like the magic apple of the Tree of Avalon) and knowledge from its inhabitants. But the gates remained open only for the night itself, and the hero must return by cockcrow or be locked in, possibly forever. The Celts also found another function for Samhain, one which capitalized on the nature of this holiday as a liminal point in time, as well as on the transparency of the veil between the worlds. They considered it a threshold into the spirit world, when divination and understanding of secrets and mystery was possible, and when their understanding of past, present and future could be enhanced. The Celts viewed time differently than we do, as cyclical rather than linear. Our contemporary idea of each new year is a milestone in the straight line that is time, running from birth to death. These markers stack up year after year, always going forward, never to be revisited, with no possibility of touching a future year. But the Celts saw time as a circle with no real beginning or end, and believed they could touch the past or future as other points in the circle. On Samhain, with the spiritual world so accessible, they used various forms of divination to see the meaning and significance of the past and future with heightened insight and intuition. Dreams on this night were considered from the gods, They saw portents on the morning after the great Samhain bonfire in the colors and shapes of its ashes. The apple played a prominent role in Samhain rituals in the role of a divinatory tool because of its reputation as the fruit of the magical Tree of Paradise. Victorians still cut apples in half so the seeds appeared like a star, then counted them to figure out the first letter of the name of a future mate. And the winner of the bobbing for apples game would be the next one married, a part of the game still alive even in the 20th century. The Celts also ate hazel nuts to increase their ability to understand the signs and omens of the otherworld, the way young Gwion Bach of Wales found himself accidentally filled with cosmic knowledge and insight when he licked his fingers after burning them in the magic potion of the goddess Ceridwen. The hazelnut tree also leads us to the tarot, in that the Magician’s wand is traditionally believed to be made from the hazel tree. The Celts reflected on the past and tried to peer into the future on Samhain, and the tarot can help us celebrate this aspect of the holiday by acting as a reflection of our path as it takes a new turn.